It’s been said many times, that the difference between ‘animal welfare‘ and ‘animal liberation‘ is – welfarists want bigger cages, liberationists want empty cages. 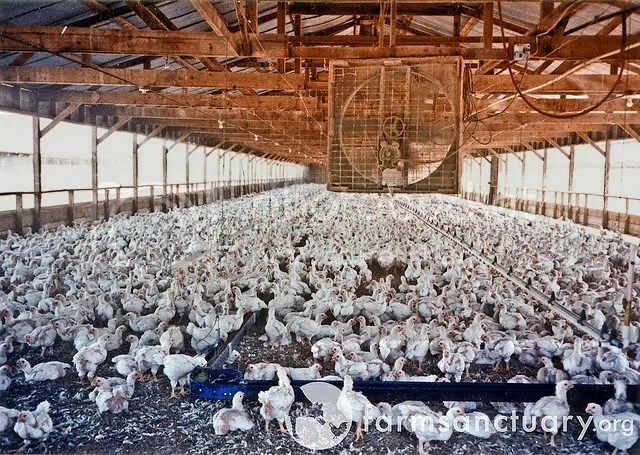 And this is one reason why… (click free range chickens to see what “free range” is in reality). Words such as “free range” may allow the consumer feel better with sentimentality about chickens roaming the paddock (a New Zealand word for field or pasture) at will, but, how does the egg-laying hen cramped in a barn never seeing sunlight or cow on the way to slaughter agree? For example, the current campaign in New Zealand, Australia and United Kingdom, to oppose the religious exemptions for humane slaughter. This means animals are being slaughtered without stunning first. It does not matter how well the animal is treated during their unnaturally shorterned life, the use of any animal for any reason for food is cruel and exploitation. Humane slaughter is still SLAUGHTER. An abolitionist vegan would say, the world should be vegan, and to support the ban on overturning of exemptions would suggest that any slaughter is acceptable. And to campaign for more humane slaughter is a welfarist position. A liberationist vegan might say that animals shouldn’t be slaughtered at all, and seek to “liberate” them from their cages. Or perhaps be realistic about a situation and know that until the world goes vegan, to ignore the lack of pre-slaughter stunning inflicts more torture and unnecessary cruelty until then. Source: Farm Sanctuary at Flickr. “Feel free to distribute freely for not-for-profit use, but please credit Farm Sanctuary” (photo linked to Farm Sanctuary, but uploaded at photobucket. For the life of an individual animal, it might be bigger cages, or equivalent depending on the animal involved. For all animals it is a set back in terms of the fight for rights. Sales of the RSPCA’s Freedom Food chicken is up £55 million from £16.4 million to £71.6 million since March last year, compared to a drop of more than £26 million for standard chicken, figures from Kantar Worldpanel show. The amount of Freedom Food chicken sold in supermarkets increased by more than 15 million kilos, compared to a decrease of 11 million for standard chicken, according to the research. The result of this “freedom” foods”*, is an increase in the sale of dead chicken body parts, by four million kilos. This effect of increasing sales due to consumers feeling less guilt is dealt with by Matt Ball, of Vegan Outreach, when he asks the question: Does working for or supporting welfare measures harm the longer-term goal of bringing about liberation? Matt Ball takes the position, how would you feel if it was you? In a cage being tortured for day after day. Would you want people agitating for change , no matter how small, and then keep fighting with every incremental change, Or would you prefer to have a hard-line uncompromising absolutist say, if the prisoner cannot be free all the way, then let them suffer until we win their freedom. Fighting for incremental reforms may make one a “welfarist” (oh the horror!) but what is a label? if that person is still fighting for liberation, something the critics often fail to. However, the fight must go on, even if reforms are gained, it is not as if liberationists give up the fight, they just know there are other battles, life and death issues that are out there, and will stay out there, until all animals are free, until all cages are empty. *Freedom Foods, a label from the RSPCA on animal products. Welfarism in action. Regulating the cruelty, not preventing it. Four years after Hurricane Katrina hit New Orleans, survivors living in Houston are still fighting to keep a roof over their heads. On Aug. 31, three women spoke at a news conference at the Kensington Club II townhome apartments to expose the owner’s corruption and the squalid living conditions he allows. The news conference was organized by Lenwood Johnson, a housing advocate with the Free Man’s Neighborhood Association. Johnson explained that the Kensington Club II owner is accepting Disaster Housing Assistance Program vouchers from the Federal Emergency Management Agency—yet is not crediting all of the renters’ accounts as being paid. Kofi Taharka, president of the National Black United Front and a representative of the International Action Center, also spoke. Then residents Eugenia Brown, Quinna Brown, and Jennifer Whittington addressed reporters. Whittington, who is severely disabled with arthritis and also has cancer, cannot work. She said she was depending on DHAP to contribute to her rent, but after complaining about conditions she received an eviction notice. The writer spoke on behalf of the International Action Center. Articles copyright 1995-2010 Workers World. Verbatim copying and distribution of this entire article is permitted in any medium without royalty provided this notice is preserved. This is in no way intended to trample on the copyright ownership of this piece. 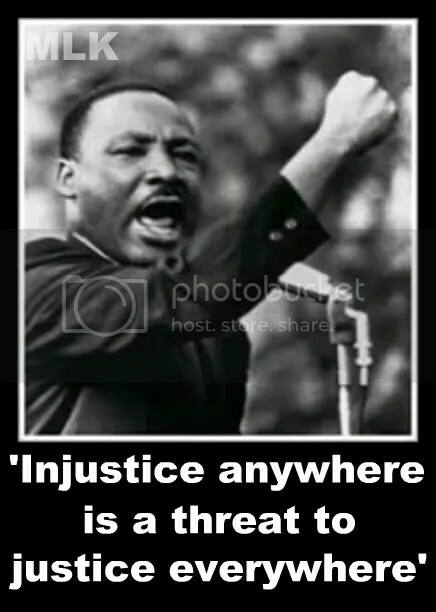 It is to disseminate ideas about justice, civil rights and civil disobedience for educational purposes.